At a recent Royal Academy event architect Daniel Rosbottom compared Ai Weiwei’s use of brick in his buildings with the sunflower seeds in the famous Tate Modern installation: “each brick is different, but also part of a multitude”. 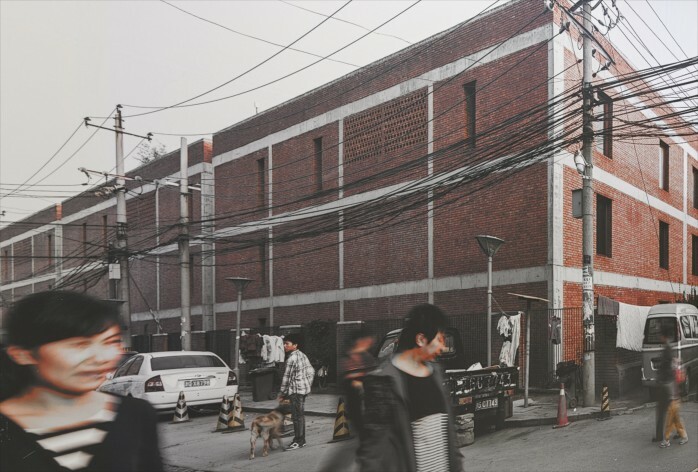 Ai’s poetic sensibility in the way he uses materials can be evidenced at RA’s retrospective, on until December 13, where a small separate exhibition tells the story of the studio and home he designed in the Beijing suburb of Caochangdi for himself and the series of brick houses around it. With Swiss architect Simon Hartmann and expert on Chinese art Philip Tinari, Rosbottom spoke about architecture as part of Ai’s art and activism, drawing parallels with minimalism in the way the buildings make you think about spatial volumes. As Rosbottom points out the debt to artists like Donald Judd might be unconscious, but the play with proportion and spatial tension is similar. Hartmann met Ai Weiwei in 2004 through Herzog & de Meuron (who collaborated with Ai on the Bird’s Nest Stadium in Beijing and the 2012 Serpentine Pavilion in London) and admires the Chinese artists’ laid-back “relaxed” attitude towards design. When Ai was commissioned to do a house for a collector in upstate New York, he invited Hartmann’s young practice HHF on board and they have worked together on several projects now. Ai has no architectural training, but has an innate sense of three-dimensional space “an absolute eye” as Hartmann described; he is streetwise and works very quickly. “He has a deep interest in the way people live”, Hartmann described Ai’s architectural approach “not just as a shape, but he always thinks about how it would function, if it feels ok”. He is very specific about proportion, whether something should be bigger or smaller. But to make his designs meet the requirements in a real-life situation he relied on the expertise (and the precision, as Hartmann jokes) from the young, emerging Swiss practice. When Norman Foster came to visit Ai’s studio he recognized a rare formal talent, which, Hartmann said, made Ai immensely proud and happy. Ai’s life has been an exceptional existentialist journey. When his father, the great poet and intellectual Ai Qing was sentenced to hard labour, they lived underground – literally – in a cave. But as Ai has pointed out, one can always also find beauty in difficult circumstances. In his poetic mind, this experience must have left traces and references that shape his spatial and material awareness. When Rosbottom visited the Caochangdi community he was struck and moved by the sculptural power of Ai’s buildings. Although they are “crudely made” and basic in their structural systems – “no insulation, alarms or electrical pieces” – there is a sense of control in each detail, he says, a harmony of proportion that is lost in many contemporary developments. Rosbottom and Hartmann both have great respect for Ai’s intuitive working method and confidence: “the art of decision making”. I was wondering if too much theory in architectural training leads to overly elaborated designs. Rosbottom, who is also Head of Interior Architecture at TU Delft, agrees that a lot of theoretical analysis is expected from architecture students. In today’s complex urban situation, however, perhaps that is needed. But would it be possible to bring some of that formal simplicity and harmony of Ai’s architectural explorations into, say, improving housing in the UK crisis? In the same way as Le Corbusier, Ai Weiwei plays with materiality and proportion. A poetic manifesto on architectural form from Ai Weiwei in the face of the current urban transformation would be wonderful. We heard he is working on a memoir – which hopefully will bring more light on his spatial sensibilities as well.